One of my favorite recipes from childhood was my moms Southern Chicken and Dumplings. As easy as it was to make, I don’t think we had them often enough. There was just something about that rich creamy chicken broth and fluffy dumplings that screams comfort food. A classic Southern recipe, I would expect it to be pretty high in calories and points, but this recipe defies odds without losing flavor. Over the weekend, I decided to whip up some chicken and dumplings. 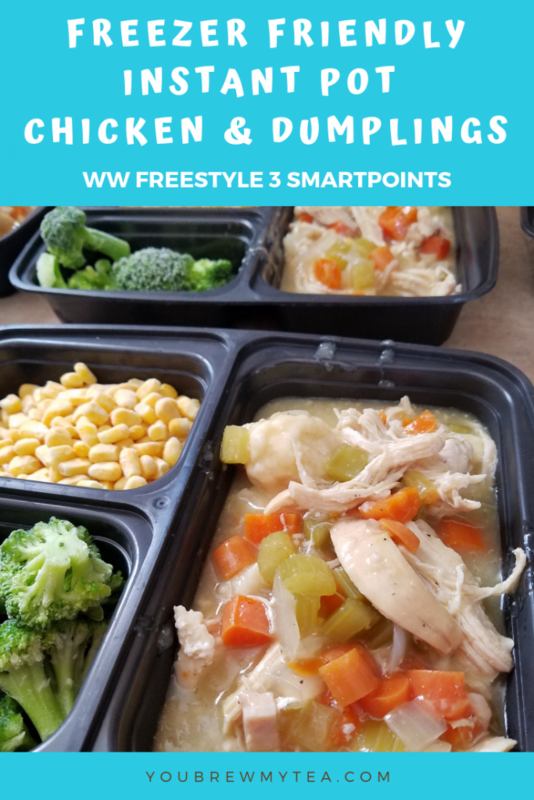 I was prepared to take a hit on points for the comfort food recipe, but once I put everything in the WW App, I was shocked to see that each serving was only 3 SmartPoints! What a win! Of course, as a child, both my mom and my Granny would make their dumplings from scratch, but on occasion, I saw my mom pull out the box of Bisquick and make dumplings using it for a faster process. So, I did the same and the results were amazing! Note: I initially made these in my Instant Pot, but you can easily adapt for the stove top or even a slow cooker using the directions I list in the printable version of the recipes below. I use the Instant Pot Duo60 6-quart or the Crockpot 6-Quart Cook and Carry Programmable option. This recipe works well for any system, just adjust settings accordingly. 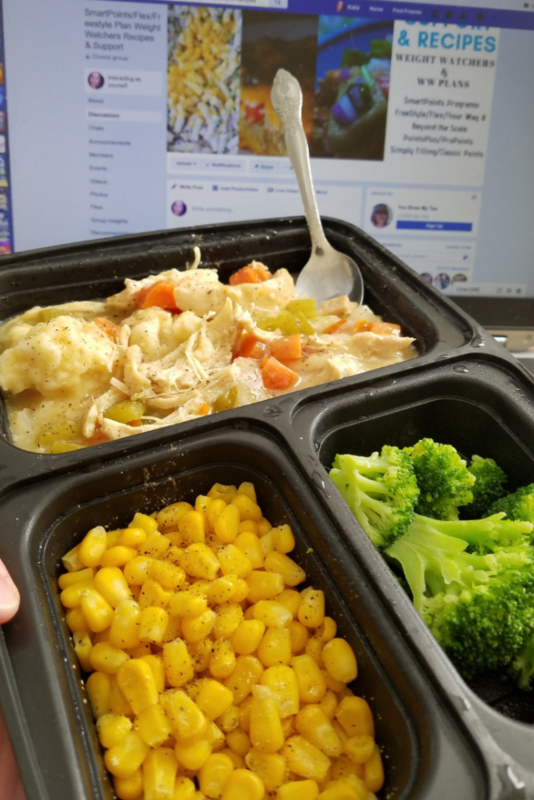 This recipe is part of my weekly meal prep and can be easily frozen to reheat later. 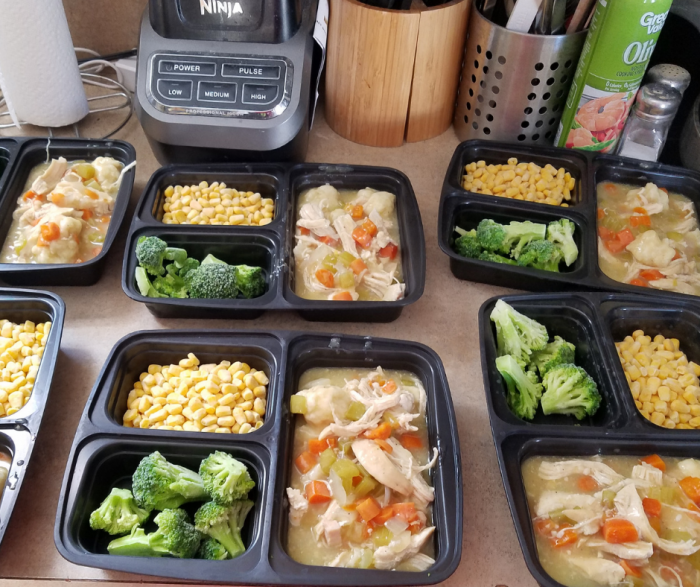 I use the 3 Compartment Meal Prep Containers for my freezer meals. 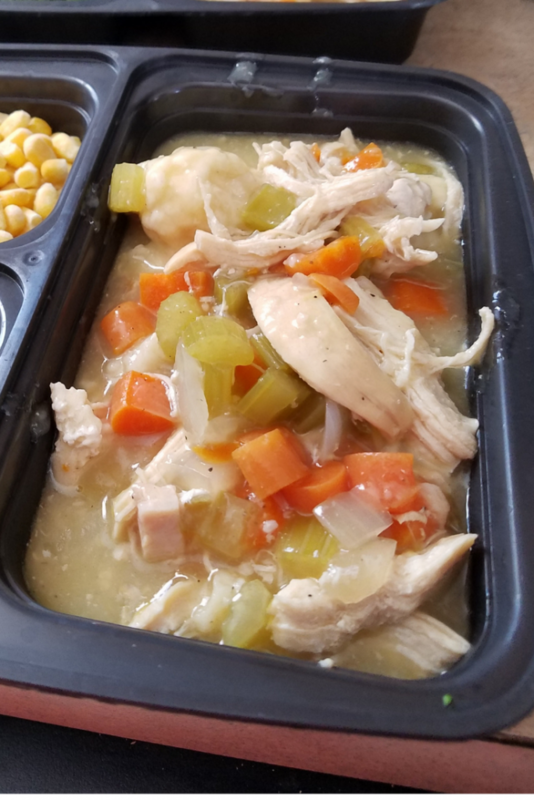 Place chicken breasts, chicken broth, vegetables, garlic, and black pepper into the Instant Pot liner. Place the lid to seal and set pressure cooker to manual high for 17 minutes for full breasts or 12 minutes for chicken tenderloins. Once the cooking cycle has completed, allow to NPR (natural pressure release) for 3 minutes then safely release remaining pressure. Remove the chicken breasts and 1/2 cup broth/juices from the Instant Pot. In a medium bowl, place 1 cup of Bisquick mix. Add in 1/4-1/3 cup of the broth you removed, to the bowl and mix until a sticky dough forms. Add chicken back to the Instant Pot and set to saute setting. Mix in the can of cream of chicken soup. Using remaining broth and 1 tablespoon all-purpose flour, mix a slurry for thickening the mixture. Add back into the Instant Pot and stir well to combine. Divide the sticky dumpling dough into 12 equal portions and drop by these into the chicken and vegetable mixture. You can do this by rolling out with a bit more flour or Bisquick, or simply drop by spoons into the Instant Pot. Continue cooking for an additional 5 minutes or until dumplings are cooked through. Remove the chicken breasts and ½ cup broth/juices from the Instant Pot. In a medium bowl, place 1 cup of Bisquick mix. Add in ¼-1/3 cup of the broth you removed, to the bowl and mix until a sticky dough forms. Place chicken breasts, chicken broth, vegetables, garlic, and black pepper into the Slow Cooker. Cover with lid and cook on low heat for 4 hours. Remove the chicken breasts from the Slow Cooker along with ½ cup of the juices/broth. 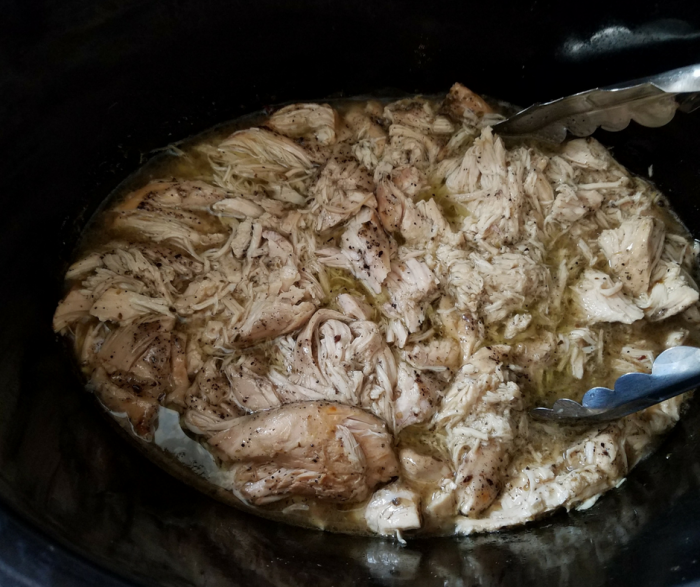 Shred the chicken and add back to the Slow Cooker along with the can of cream of chicken soup. Using remaining broth and 1 tablespoon all-purpose flour, mix a slurry for thickening the mixture. Add back to the slow cooker and stir well. Divide the sticky dumpling dough into 12 equal portions and drop by these into the chicken and vegetable mixture. You can do this by rolling out with a bit more flour or Bisquick, or simply drop by spoons into the slow cooker. Cover and cook for additional 30 minutes. Place chicken breasts, chicken broth, vegetables, garlic, and black pepper into a large stockpot. Cook over medium-high heat for 30 minutes. Remove the chicken breasts and ½ cup juices from the stockpot. Shred chicken breasts and add back to the stockpot along with the can of cream of chicken soup. Divide the sticky dumpling dough into 12 equal portions and drop by these into the chicken and vegetable mixture. You can do this by rolling out with a bit more flour or Bisquick, or simply drop by spoons into the stockpot. My Southern Chicken and Dumplings recipe is inspired by the recipe my mom and my Granny made when I was a child. It’s a perfect option for comfort food that also stays within your daily points easily. If you are looking for more yummy comfort food ideas, check out some of the ideas linked below! 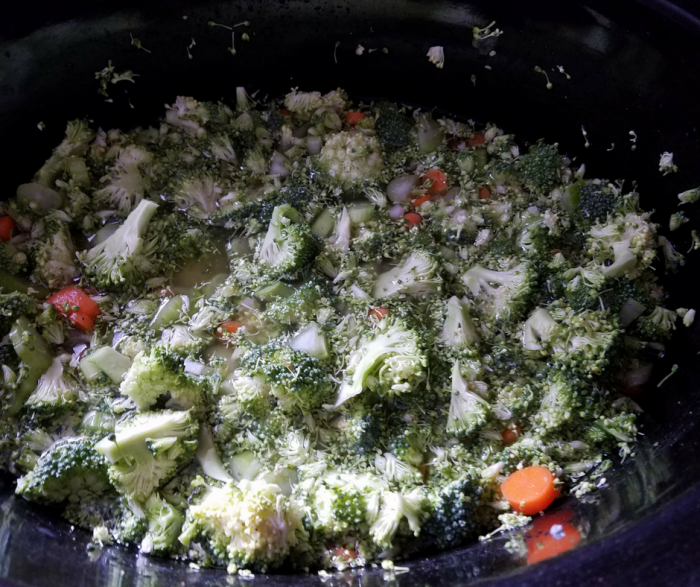 We can’t live without soups in the fall and winter, but this Slow Cooker Broccoli and Cheese Soup is one that I will indulge in year round. It is a healthier version of our favorite Panera Bread recipe with tons of flavor and all of the creaminess you expect. 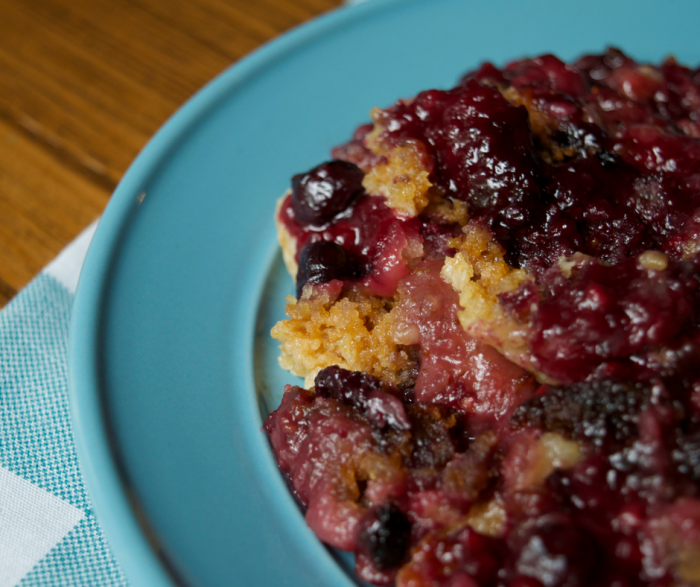 While not the lowest calorie recipe we have shared, it is a great treat that is definitely better than traditional. We recommend using all fresh vegetables for this broccoli and cheese soup. Canned or frozen just won’t give you the desired effect. You want the carrots and broccoli to be tender, but not mushy. 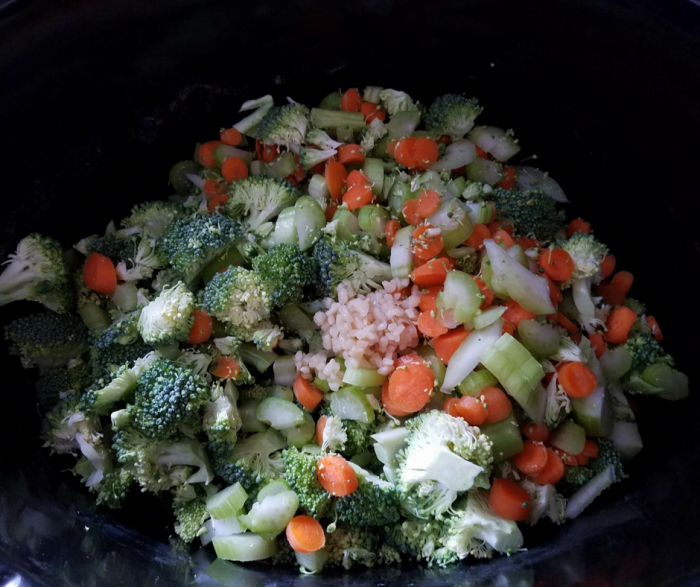 I always use my 6-quart programmable cook and carry slow cooker, but you can use whatever brand or option you prefer as long as it is a larger slow cooker. Dice broccoli, carrots, celery, and onion into fine pieces. You may alternately shred the carrots and onion if prefer smaller pieces. Place vegetables along with broth into slow cooker and cook for 3 hours on highest setting. Remove the lid and stir in the half and half, 1/2 the cheddar, and black pepper. Replace lid and cook for 30 minutes. Remove lid again, adding in the remaining cheddar cheese. Stir well and cook additional 10-15 minutes or until cheese is melted. Taste for seasoning, and add salt if desired. Serve alone or with your favorite crusty bread. Remove the lid and stir in the half and half, ½ the cheddar, and black pepper. While you can cook this slow and low on the stovetop, we found that our friend Sadie’s Broccoli Cheddar Stovetop Soup is a better option for stovetop cooking. It’s also a Weight Watchers friendly soup, so you don’t have to worry about high points! Making this broccoli and cheddar soup is a perfect way to encourage your whole family to get more vegetables into their day. A hidden veggie like this soup is ideal for those picky eaters. 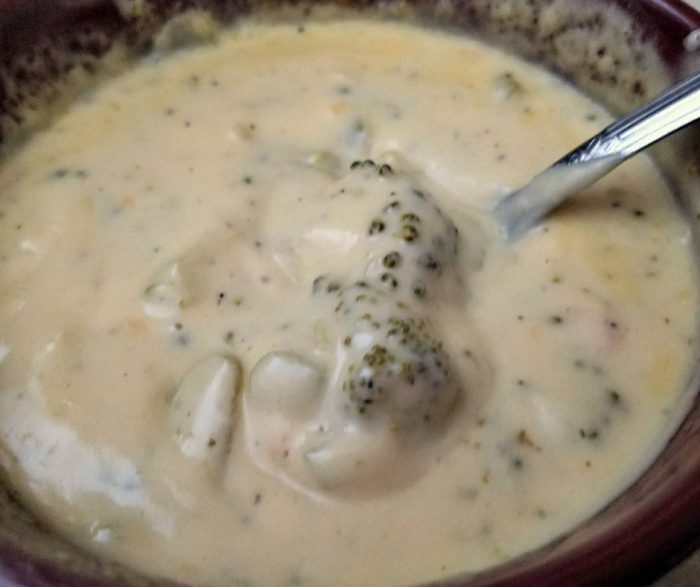 Even our son who hates broccoli loves this soup because it has such small pieces in a flavorful soup. With a generous 1 1/2 cup portion, this is definitely more than enough for a whole meal. 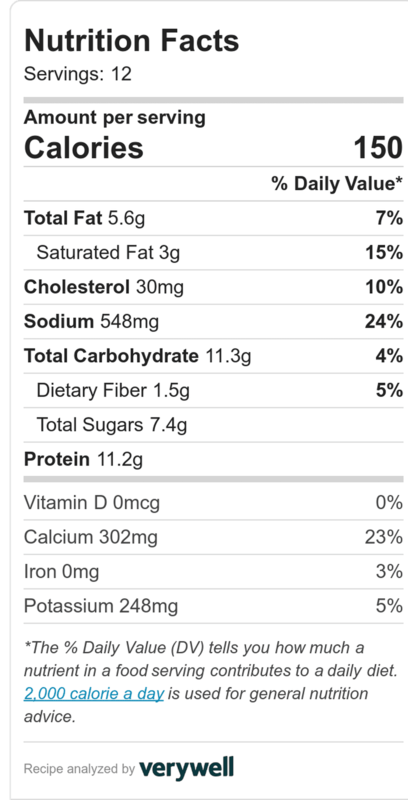 However, if you have the points and calories available, then you’ll want to add a nice crusty bread to this recipe. Another option is to serve with one of our cheddar bay biscuits or even our healthy biscuit recipe using Greek yogurt. Whatever you choose, you’ll love this as a comfort food recipe to keep in the rotation all winter. 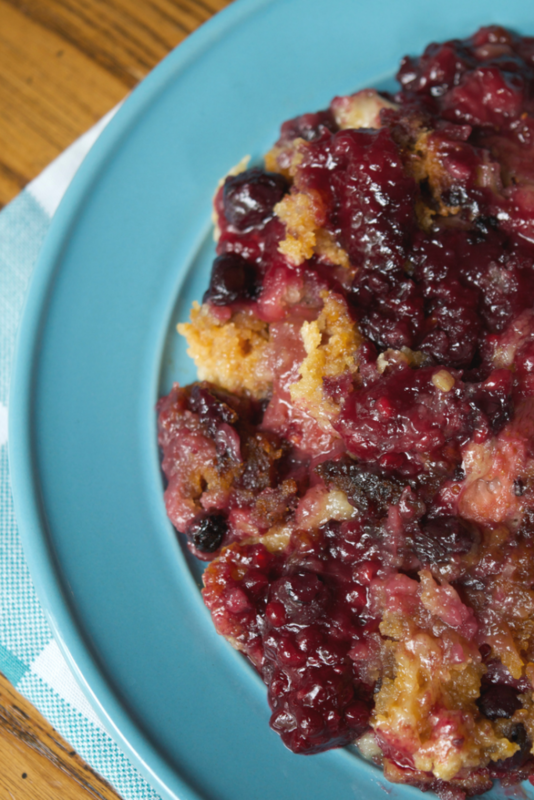 There is nothing as easy and delicious as this Mixed Berry Crock Pot Dump Cake on a hot summer day. Served by itself, or with some low calorie whipped cream or ice cream for a special treat. By cooking in the slow cooker, you won’t be heating up the house. You’ll get all the delicious flavor with half the work! We use a 6-quart slow cooker for most of our recipes, but you can use a smaller one if that is what you have on hand. I have also been in favor of using slow cooker liners for recipes like this. It just makes cleanup so easy! Our good friend, Emilee, made this for us a few weeks ago. 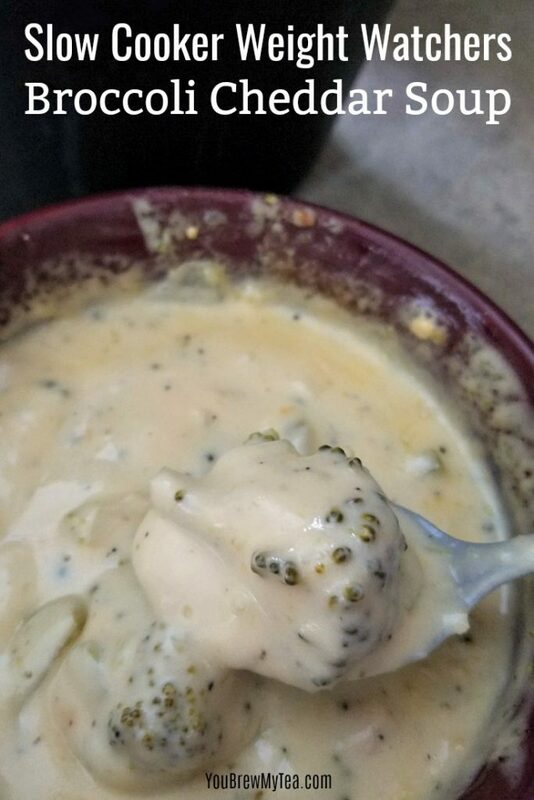 She is always making yummy recipes to share with our readers! This one is also kid-friendly! Pour pie filling and blueberries into the slow cooker and stir until mixed well. Sprinkle cake mix on top of berry mixture. Place lid on the slow cooker and cook on high heat for 2 hours. You may wish to lightly stir to mix the cake with berry filling. 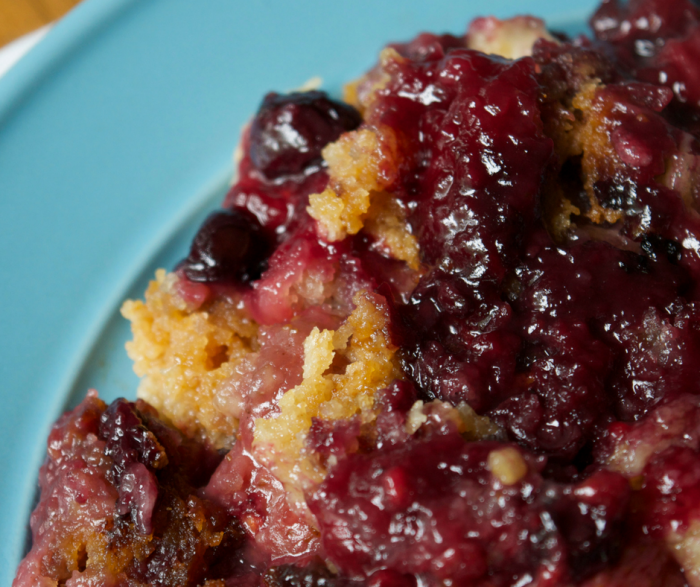 Make our Crock Pot Dump Cake for a delicious and easy dessert this week. 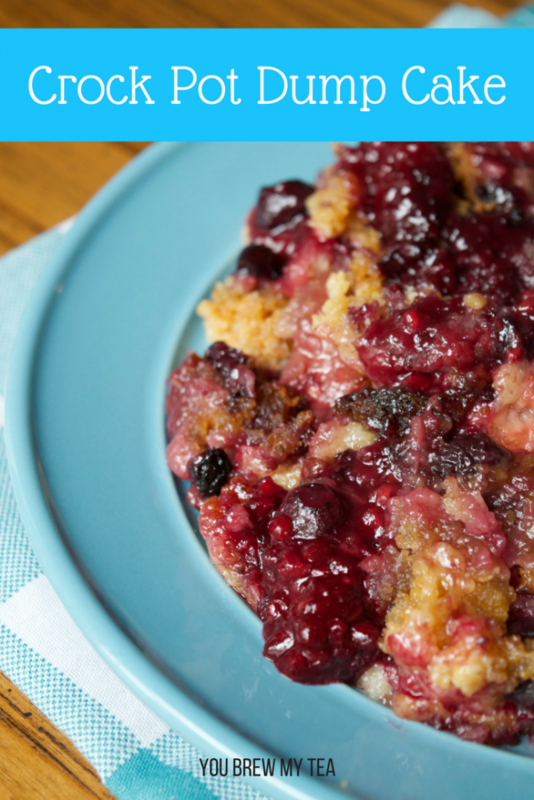 You can throw this together in minutes, then forget it until dessert time after dinner! Kids love this because it is yummy and a bit messy looking. Adults love it because it is absolutely delicious! You can easily add in different berries, all fresh, or all frozen. Use whatever you prefer, but enjoy this as a sweet treat. If you are looking for more great recipes, don’t forget to join our Weight Watchers Support Group on Facebook! A few years ago, I realized how much I loved Mediterranean flavors. 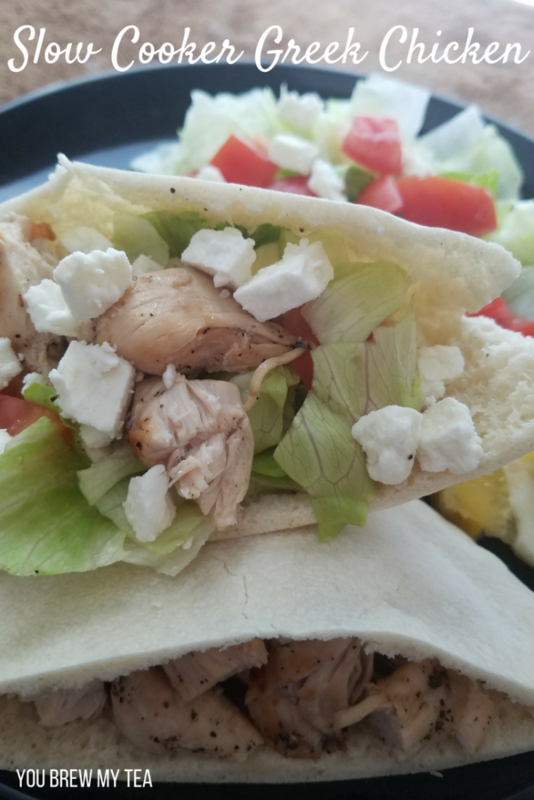 This Slow Cooker Greek Chicken recipe has become a family favorite since then. It’s super easy to make, is very versatile, and of course, the ideal meal the whole family loves. If you are looking for a great way to make chicken flavorful and easy – this is the best recipe! While I most often cook this in my Crockpot, you could easily cook in an Instant Pot or even on the stovetop. Just adjust the time accordingly. Using fresh herbs will give you the best flavor, but we typically only have dried herbs on hand. If you can plan ahead and pick up fresh herbs to have a bit brighter flavor. In a small bowl, mix together olive oil, garlic, rosemary, thyme, oregano, and lemon juice. Place chicken breasts in an even layer on the bottom of the slow cooker. Pour the spice mixture over the top of the chicken. Shred chicken and leave cooking on low for an additional hour. 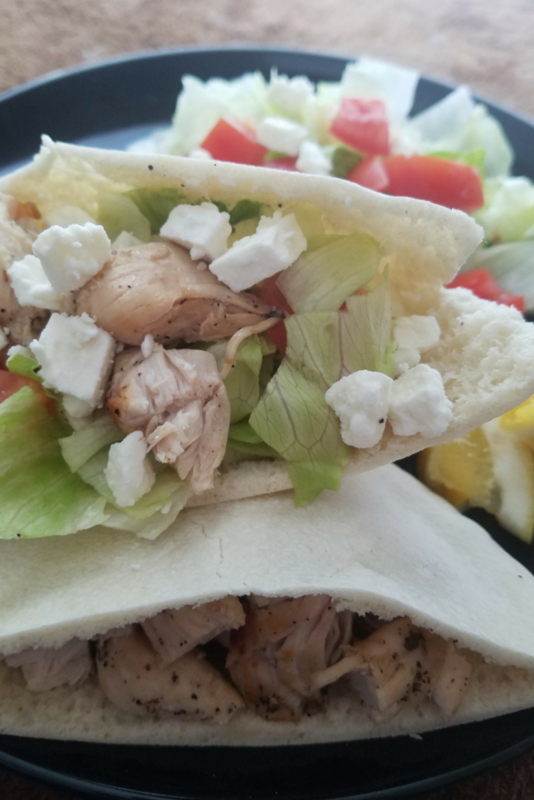 Serve in a pita, on salads, or with rice and vegetables. 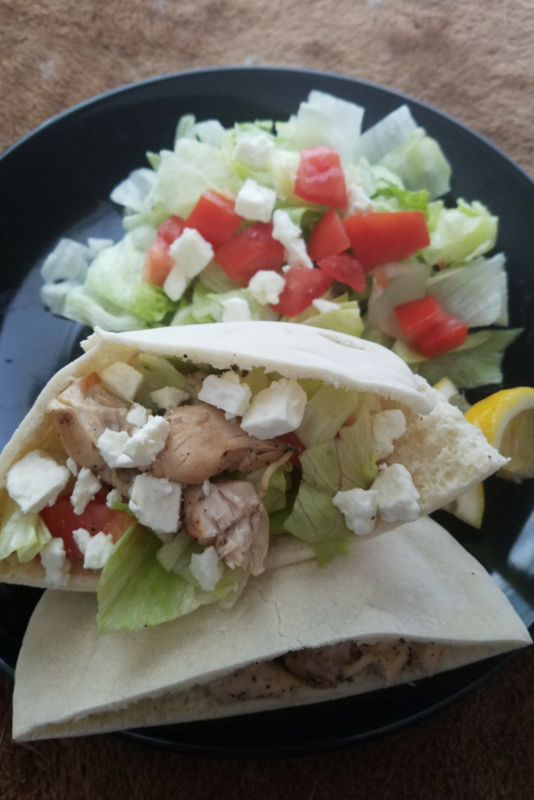 Typically, we serve this slow cooker Greek chicken in a pita with some diced tomato, shredded lettuce, and a bit of feta cheese. We’ve also served it with some of this Instant Pot Hummus. 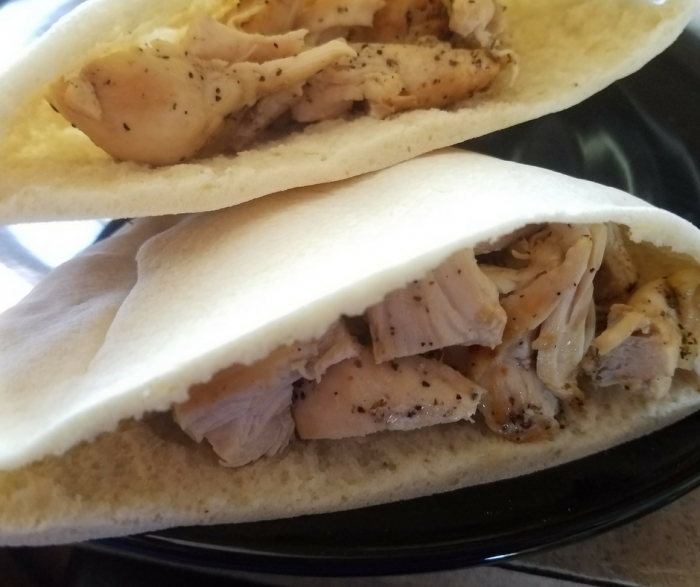 It’s so good with toasted pita bread! 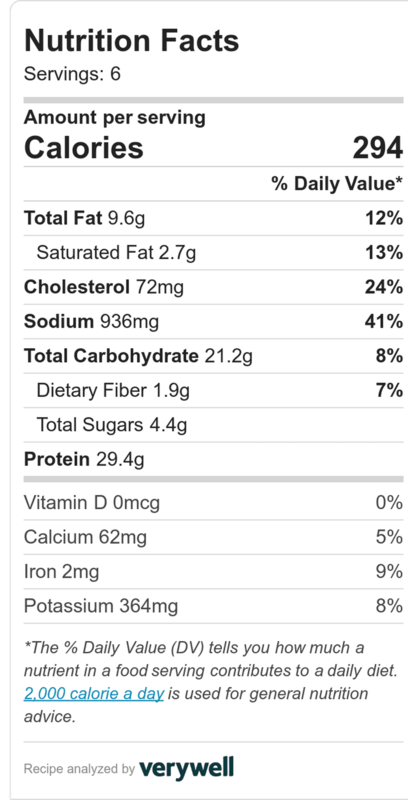 Since it is a low point recipe, it makes for a great option when you use the 1 point St. Joseph’s pita to create “chips”. 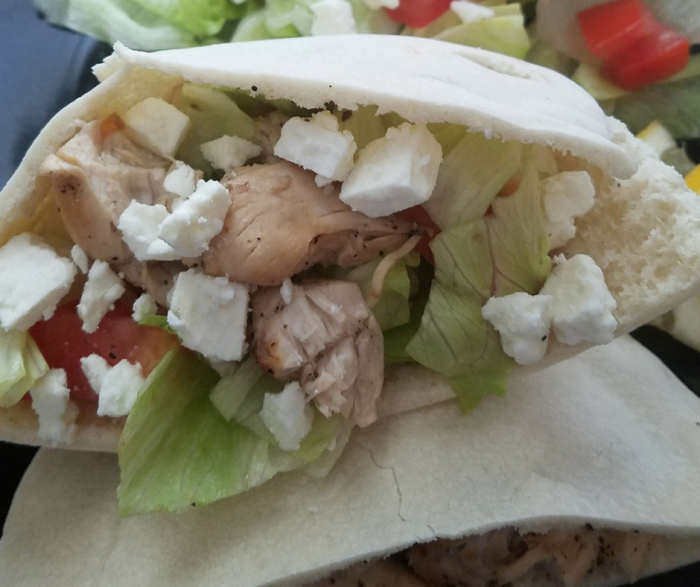 This slow cooker Greek chicken recipe is a great option to use for flavor and protein on top of a bed of salad greens, or with a side of low point roasted vegetables. We like it with our Easy Roasted Broccoli as well as our Roasted Cauliflower and Cabbage. You can also serve with a side of Wild Rice Pilaf or your favorite steamed rice. 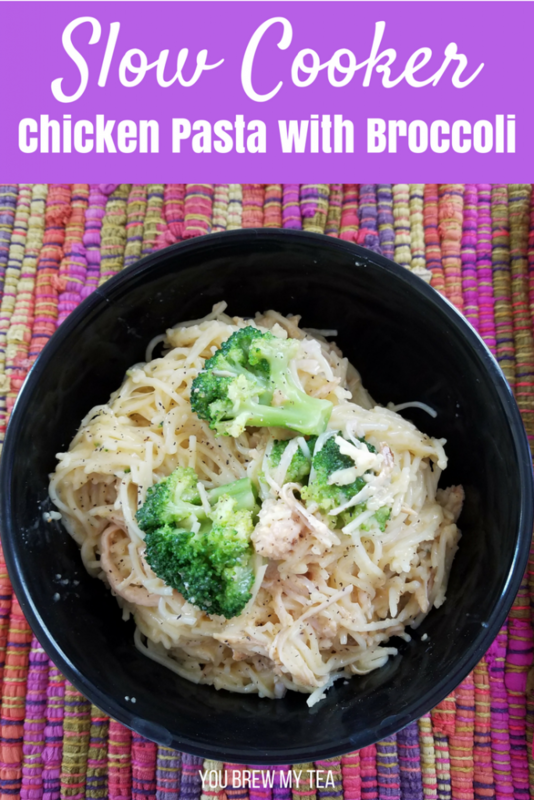 Our Slow Cooker Chicken Pasta with Broccoli is such an easy way to cook a meal that everyone will enjoy. While it does have a bit higher points than some other meals do on Weight Watchers, it is ideal for a one pot meal that is super satisfying. This post contains affiliate links. I earn a small commission on purchases made through these links. Using a slow cooker to speed up meal time is something every busy mom loves. I love my 6-quart slow cooker for this recipe. It is large enough to mix things together easily. For this slow cooker chicken pasta, it is a must to be able to shred or mix items easily. Shredding the chicken breasts after they finish cooking is how you make this so easy to pull together. 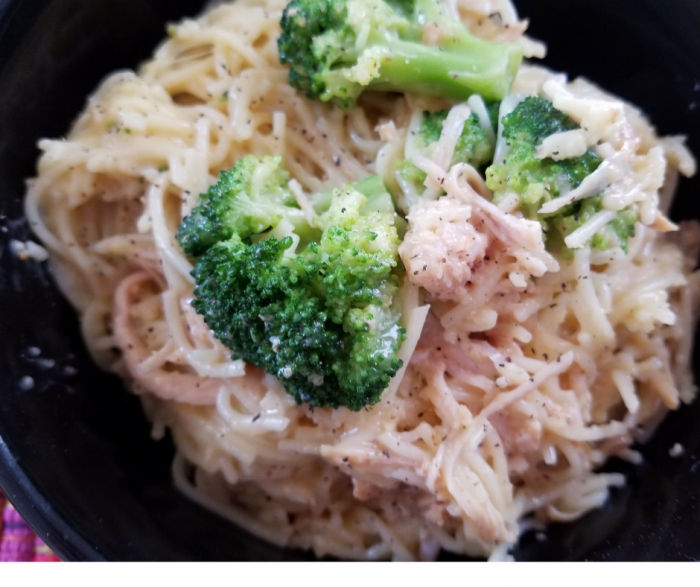 Break up the uncooked angel hair into smaller pieces (I usually break in half), and mix them along with the broccoli, nonfat plain Greek yogurt, mozzarella, and parmesan cheese in with the chicken mixture. If the mixture seems too dry, you may add additional 1/2 cup water as needed. Cook for an additional 30 minutes. Test pasta for doneness at this time. If not cooked through, continue to cook for additional 15-30 minutes (will vary depending on slow cooker). Remove the lid, stir well to combine and serve. May add additional salt and pepper as needed. 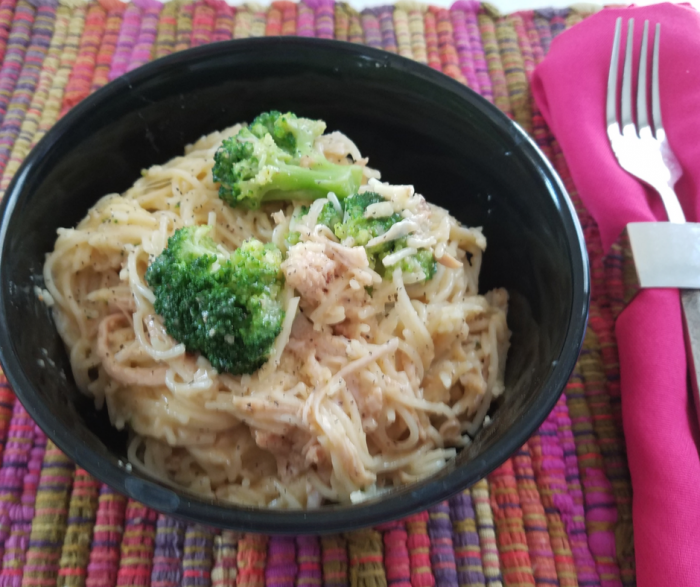 Break up the uncooked angel hair into smaller pieces (I usually break in half), and mix them along with the broccoli, nonfat plain Greek yogurt, mozzarella, and parmesan cheese in with the chicken mixture. If the mixture seems too dry, you may add additional ½ cup water as needed. 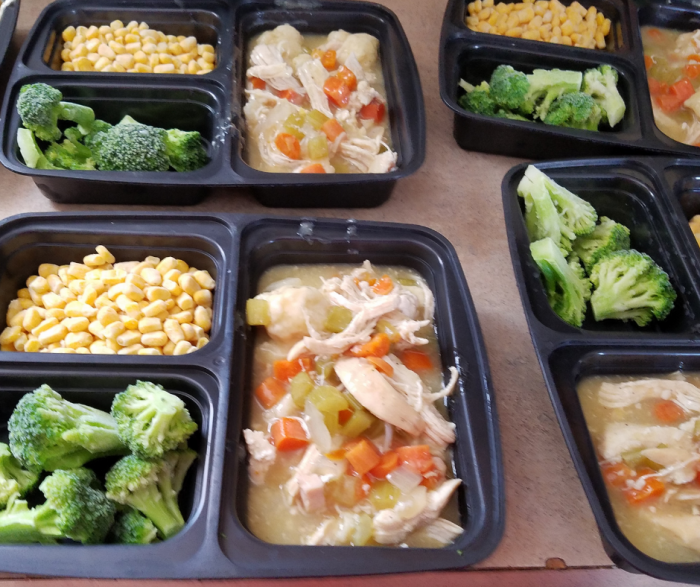 If you are making a slow cooker meal, you want it to be something that is easy to have ready when you get home from work. When you arrive home, all you have to do is mix in the last few ingredients and let it cook for an extra half hour while you check homework or do a few chores. Dinner is ready in a short time, and absolutely delicious!